Elk hunting can be a great challenge. It is a reason why hunters use such gear as rifles, camouflage equipment especially when hunting big bull elks. However, having these gear doesn’t make the task easier if you don’t have the best elk attractant. Using elk baits is rather controversial issue and moreover, it is prohibited in many states, still there is a great demand on them. We strongly recommend you, to make sure the law allows using the attractant in your location before you spend real money on purchasing bait. The elk baits kinds are on the market in a great variety. Selecting the best elk attractant is never an easy mission for a hunter. We have made a research and found baits that hunters may like and appreciate! 1. 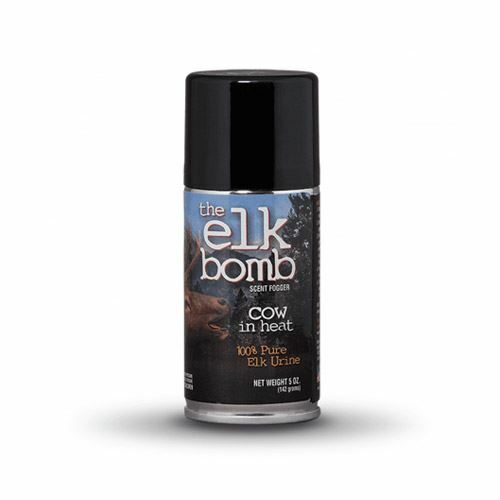 Buck Elk Bomb Cow in Heat – Absolutely Natural Scent To Lure Bull Elk! 100% Elk Cow in Heat urine in the form of the aerosol spray can be sprayed or fogged out. With a slightest breeze the scent travels a ¼ mile and attaches to the leaves and trees that allow a bulk to track the location and the object of the scent. This product is better to use during the rut period as it will make mature bulls curious about it. This is absolutely natural elk urine of cow in heat. It is a potent attractant and a strong cover scent. The scent sticks with everything it contacts. NVERTR 180-degree ball valve allows you to spray in any position. Spray button may stuck or break. 2. Carlton’s Calls Estrus Urine – Super Natural Attractant That Spreads On A Long Distance! To make the rut period more effective, you should use this pure elk urine that was taken from a cow elk during the peak 24- 36 hours breeding cycle. It provides a good mist that spreads itself to make rutting bulls curious. The scent comes in a 2 oz of cow elk estrus. This is specifically sexual attractant. The bottle of the spray is UV-protected has an atomizer for maximum scent dispersion. It may leak on the hands when you spray. 3. Harmon Scents – Elk In Heat – Rub On Scent Stick – Nothing Is More Durable Than This! 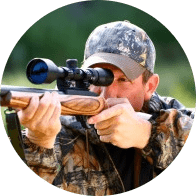 It is easy to use and is rather effective for different hunting purposes. You can use it on the trees, hunting boots, decoys, etc. Scent stick is very compact and still stays fresh for almost 2 years. The stick lasts longer than usual sprays and doesn’t leak. Cow elk female in heat urine attracts all the bulls around. The wheel controller of the scent’s amount can stuck. 4. 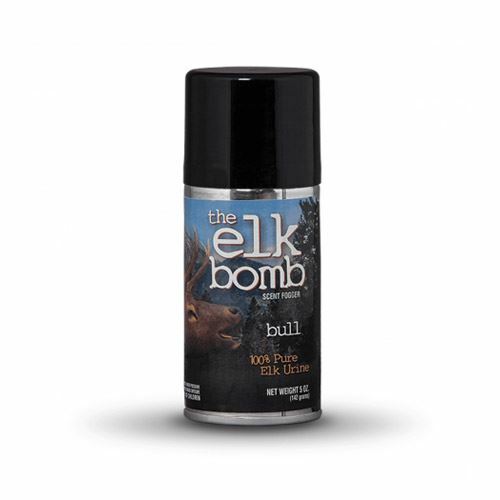 Buck Elk Bomb Dominant Bull – Attract Big Bull Elk With A Single Diffuse! The Elk Bomb Dominant Bull Urine brings out the aggressive territorial breeding behavior in Dominant Bull Elk. 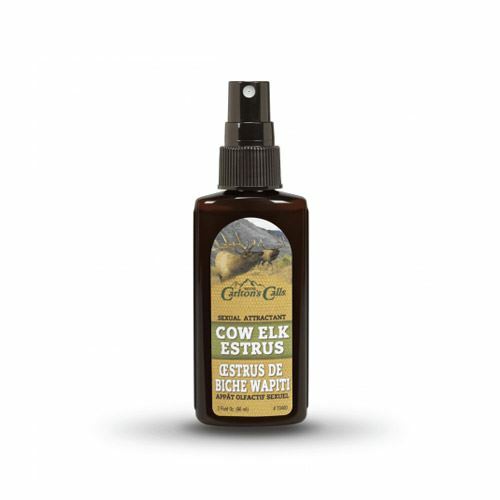 The mix of a high- quality Bull Elk Urine and atomized nozzle makes it a perfect gear for a hunter who tries to lure an elk. This spray contains absolutely fresh and natural bulk urine. NVERTR 180-degree ball valve allows spraying in short bursts or the entire content if you lock it down. The scent travels in 3mph and easily sticks to the leaves. It is perfect to use during rut season to make scent trail or mock scrapes. The nozzle of the spray may stop to work or break. 5. Nose Jammer 3304 – Block The Elk’s Nose Smell Abilities And Bring It To Your Spot! Nose Jammer provides hunter with a cloud to make it difficult for an elk to detect or track human’s odor. It can be sprayed on the hunting clothes, boots, trees, etc. When the wind blows, elks get jammed and they stay unalarmed. It is better to use Nose Jammer Field Spray along with the other products of Nose Jammer for greater effect. It blocks the elk’s ability to smell and lets a hunter to get to the animal closer to make a great shot. It consists of vanillin and organic substances that are all natural and do not threat no one’s health. It is simple to use it as you just uncap and spray. 6. 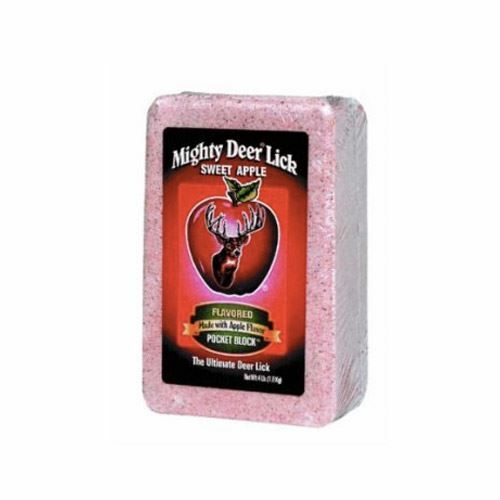 Mighty Deer Lick Sweet Apple Block – Please All Elk Around With The Sweet Apple Flavor! This hard pressed block is one of the most durable blocks on the market. It is developed to attract elks and provide important nutrition for health. It helps elks to retain the water and fat that is especially important in winter. Placing this block in your chosen spot, an elk can be attracted peacefully. It is a poly-wrapped block so it is protected from a human scent. It is used not only as an attractant but to provide animals with all the necessary supplements for a better health. It may work better only during apple season. 7. 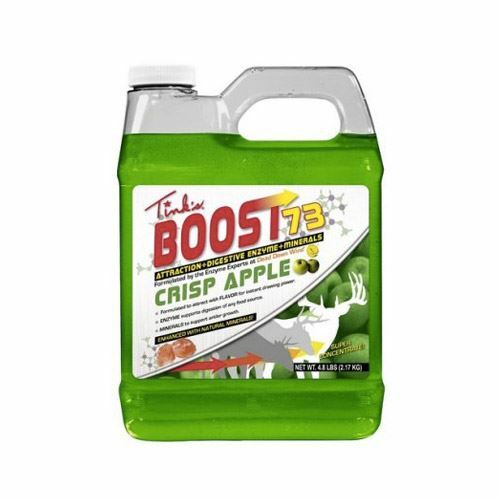 Tink’s Boost 73 Apple Food Attractant – Take Care Of Elks Health And Hunt The Big One! Boost 73’s special formula provides much longer range luring for hunting that has a strong food scent. It supports animal with the essential minerals. Thanks to the enzyme technology elk gets better digestion and nutrition. This is super concentrate attractant that is enhanced with the natural minerals. The crisp apple flavor was formulated to attract animal for instant drawing power. Digestive enzyme also supports elk’s digestion of any food source. It is rather sticky so you have to be careful when pouring the liquid out. 8. Tink’s Boost 73 Vanilla Food Attractant – Let The Elks Be Healthy and Big For Your Best Shot! This irresistible acorn flavor attracts elks more than ever. It includes about 60 effective minerals for elk’s health. The liquid works if you use it along with the food source that elks prefer. The Boost was formulated by enzyme experts at Dead Down Wind. It perfectly masks hunter’s scent and makes it untraced for animals. The package is rather big that you should pour some in another container. This type of stick can be compared to the Degree stick that human uses. It is lightweight and very easy to use. It doesn’t leave any spots and doesn’t leak as others baits. Such attractant lasts longer than usual. Similar to scent sticks, spray elk attractants are very convenient to carry in the pack or pocket, and it is a great choice if you hunt in some location temporarily because it produces rather strong smell that quickly fades away with a slightest breeze. Usually sprays contain natural cow elk or bull elk urine. Liquid attractant is used by pouring onto the elk food or the ground to allow the liquid soak and dry so there is a site that makes elk to be curious about it. Liquids are usually enhanced with the minerals to provide animals with the essential supplements for healthier growth. Solid elk attractants imitate the food or minerals. They come with different sweet and sour flavors. It is better deployed before the hunting season starts as an elk has a chance to look for the solid and return every time there. The typical form of the solid is a lick square block that is poly-wrapped to protect from human scent. Using elk attractant scent stick you have to choose a location. For instance, it can be used on any surface: clothes, boots, trees, leaves. To use spray elk attractant, you can spray the mist on the food that elk prefer to eat or trees, bushes, etc. If the aerosol nozzle is able to produce enough scent you may spray some to the air, so it will be dispersed by a breeze. Liquid elk scent is made to be used employing a drag rag to make the wrong trail and to lead to the hunter’s location. It also can be poured on the food source for elks. Solid elk attractant come in lick blocks so it is easier for elk to reach the source. You do not have to do anything special but to choose the location and to leave a block there unwrapped. Most of elk hunters considering elk scents don’t think that are going to use them along with elk decoys although. It is extremely important as these two major principles are connected together. When an elk follows a scent trail, it expects to find and see another cow or bull elk. It should be mentioned that attractants which produce a strong smell hunter should use for temporary for example, if you hunt just 1-2 days in the same location. Permanent scent attractants can be used for prolonged hunting sessions. Choosing elk bait depends on what you are going to use additionally to make it really effective luring elk.